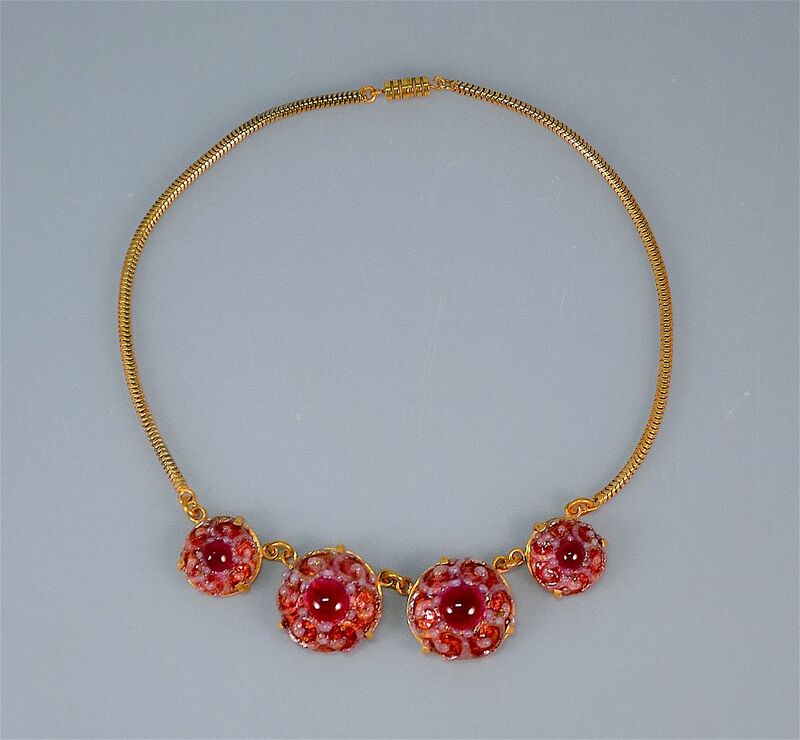 This fabulous necklace is made of enamel on copper. It consists of 4 circular domed sections, the two large ones in the centre being flanked by a smaller one. 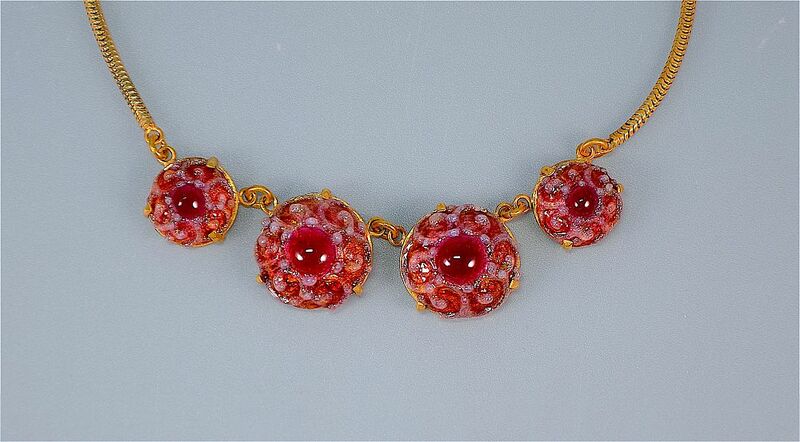 Each domed section is made of enamel on copper and comprises a central deep red cabochon above a pink/gold background to which enamel opalescent swirls have been applied. Each domed section is mounted in a gilt metal frame and there is a gilt metal snake chain leading to a barrel fastener. The rear of the two large sections are signed "C Faure Limoges". Gorgeous! He spent a long apprenticeship before setting up his own workshop at Limoges, where he worked for some fifty years. Fauré became Limoges’ most famous and talented enamel artist. He exhibited in the 1925 Paris International Exhibition. His work involved large floral and figurative patterns, often in rich colours. He exhibited through the Paris shop, Au Vase Etrusque, and produced vases, bowls, ashtrays, boxes and other items. In geometric & stylized floral patterns but it was his geometric designs which earned him the reputation as the greatest creative enameller of the Art Deco style. The geometric patterns featured strong colours of blue, red, orange and yellow accented with blacks, whereas the floral patterns had more delicate colours such as turquoise, light blue, pink, lavender and white. Some vases had panels and borders of floral motifs combined with geometric stepped and angled motifs. His friend Marty occasionally worked with him, in a similar style. 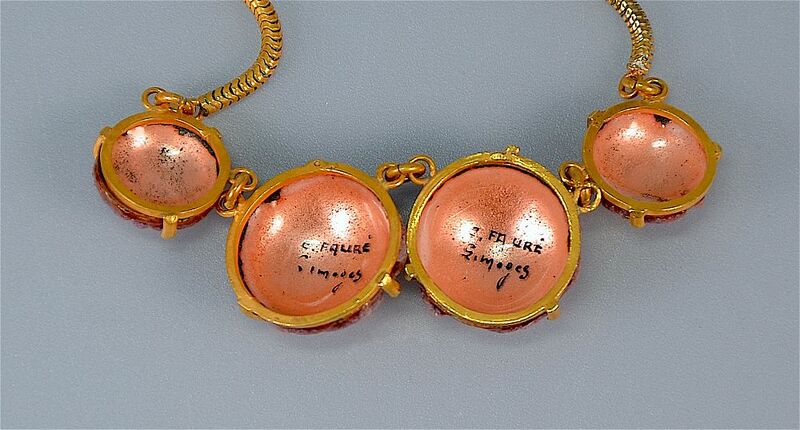 Both produced a small number of pendants in enameled gold, silver and copper.